Robo-signing and itâ€™s sibling, â€œsurrogate signing,â€ is the systematic, intentional misrepresentation or fabrication of evidence in every court of every county in every state of the United States. It is the filing of forged documents critical to a bankâ€™s case in nearly every foreclosure in our country. Itâ€™s bad enough that the banks are perpetrating fraud, but whatâ€™s worse is that their lawyers are knowing accomplices to the fraud. Lawyers are commonly referred to as â€œOfficers of the Court.â€ Thatâ€™s because lawyers take an oath upon admission to the profession to uphold the law and the integrity of the judicial process. We are the gatekeepers of justice. When we lie to judges, the integrity of our judicial system suffers irreparable harm. In Florida, only the owner of the mortgage note and mortgage can file a foreclosure against a homeowner. Usually, the plaintiff in a foreclosure case is someone other than the originator of the loan because the original note holder usually sells the loan. The document evidencing that transfer of ownership is known as the Assignment of Mortgage, which is recorded in the official records of the county where the home is located. The Assignment of Mortgage is a critical piece of evidence in a foreclosure because it establishes the plaintiffâ€™s â€œstandingâ€ to foreclose. 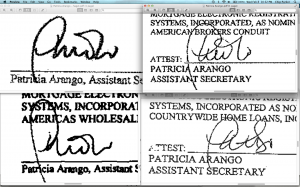 Here is a screenshot of four signatures of one â€œAssistant Secretaryâ€ of Mortgage Electronic Registration Systemsas â€œnomineeâ€ for various mortgage originators. Clearly, all four signatures do not look alike, even though this is allegedly the signature of the same person. But this person isnâ€™t just a person â€“ sheâ€™s a lawyer. And sheâ€™s not just any lawyer. Sheâ€™s the litigation managing attorney at The Law Offices of Marshall C. Watson, P.A., one of the largest foreclosure law firms in the State of Florida, and I spoke with her just two days ago! The fraud being perpetrated goes like this: The plaintiff needs the Assignment of Mortgage from the originator of the loan to the plaintiff to create â€œstanding.â€ So, the plaintiffâ€™s own lawyer creates the assignment, allegedly transferring an interest in land, and signs it herself. The lawyer then actually records this fabricated document in the county official records and also files it in the actual foreclosure case. As the litigation managing attorney for Marshall Watson, this lawyer appears regularly before judges throughout the state, and these judges rely upon her honesty in all her dealings with the court. When a lawyer lies in court, it is worse than when a non-lawyer lies because we are not just sworn to tell the truth but to uphold the integrity of the court. But what about a chief judge who is in cahoots with this foreclosure firm? Well, one of Marshall Watsonâ€™s newer lawyers is the former Chief Judge of Broward County, Victor Tobin, who, just before joining the firm, designed Browardâ€™s notorious â€œRocket Docketâ€ foreclosure court that radically tilts the judicial process in Marshall Watsonâ€™s favor. Someone really should tell Florida Attorney General Pam Bondi about this lawyer. Oh wait. She already knows. Floridaâ€™s Attorney General has had an ongoing investigation of Marshall Watson for years. The investigation was started by Bondiâ€™s predecessor, Bill McCollum, but the moment she took office, she was more focused on shutting down such investigations, starting with her firing of the bulldog attorneys assigned to foreclosure fraud. In Marshall Watson’s case, they settled for $2M, but nobody was prosecuted for any crimes. Well, even if Attorney General Pam Bondi ignores fraud on the court, surely The Florida Bar is investigating this lawyer because The Florida Bar HAS TO take robo-signing by lawyers seriously. But the Florida Bar doesnâ€™t investigate robo-signers. To the contrary, The Florida Bar HIRES THEM to oversee attorney ethics investigations (The Florida Bar has in the past and will probably again investigate ME for speaking the truth). I AM NOT MAKING THIS UP! Well, at least Floridians have our elected state representatives to protect homeowner rights in the wake of this massive fraud. Donâ€™t look now, but a new Florida House of Representatives Bill HB213 is an â€œexpedited foreclosureâ€ bill that actually MAKES FRAUD EASIER for the banks by accelerating the foreclosure process. This bill has already made it out of committee with a 12 â€“ 4 passing vote. Stay tuned for more on this selling out by our elected legislators. If you are a homeowner, who is on your side? 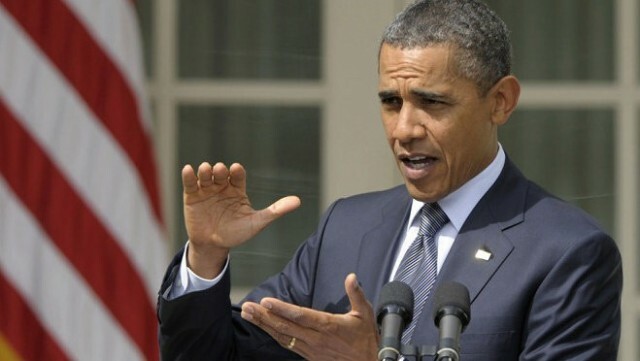 The President of the United States? The United States Congress? Your Attorney General? Your State Legislator? Your local Bar? Itâ€™s getting harder to tell, but the signs arenâ€™t good.